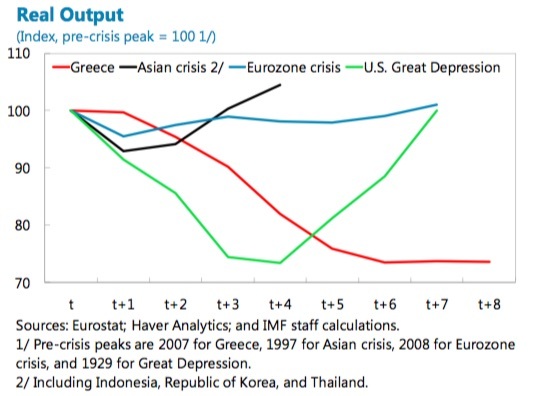 "The fact that the eurozone rolls on with no sign that a depression in one of its smaller constituent economies is enough to bring about a fundamental change is disturbing." Why so? Isn't it in fact encouraging, a sign that the eurozone can withstand such problems (especially a problem in one of its smaller economies)? There's scant reason to think it would be a good thing if the eurozone opted for "fundamental change" every time one of its constituent nations experienced a problem. Fair enough - it is true that the Greek crisis didn't cause the euro to break up at least. But I think what happened in Greece (and Ireland to an extent) is more than a local problem; it revealed a fundamental design flaw which they haven't fully confronted - the lack of a "banking union". From the outset, economists doubted whether the euro area met the traditional criteria for an optimum currency area (OCA), and those issues are relevant, but I think Greece shows that a banking union (i.e., shared lender of last resort, banking regulation and deposit insurance) is necessary to make it work. 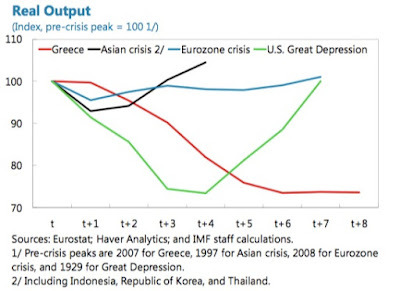 I.e., if Greek banks were european banks, the bank-sovereign "doom loop" could be circumvented. The euro area needs a way for countries to go bankrupt without bringing their banks down with them. I tend to agree with you regarding the necessity for a "banking union"; not having one is indeed a design flaw, and no, it hasn't been confronted. Does that mean the eurozone's days are numbered? Could be, but of course we won't know for certain-sure until the breakup does (or doesn't) happen. So it goes.